Visual media. Let’s talk about it. In the design and construction professions we are familiar with the visual media commonly used: drawings and models. Of course we also understand that visual media extend beyond architecture, engineering, and construction. 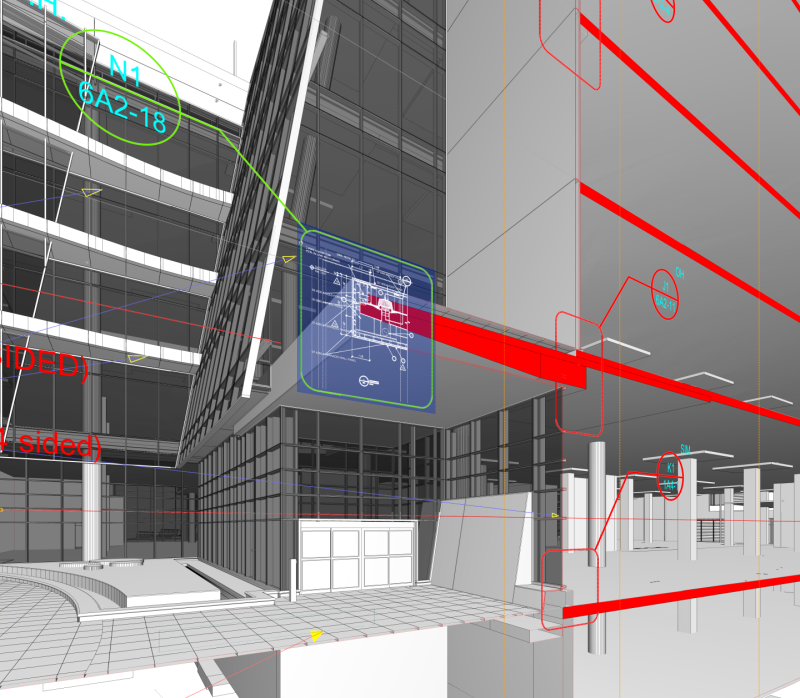 Recent innovations now appear to open a new frontier of potential significance not only in the design and construction professions, but also for visual communication media generally. To look forward into a visual media innovation frontier, we first have to look back into the past. Let’s take the common forms of media, drawings and models, and describe them. Drawings are visual representations that depict, typically, specific locations in a proposed (or actual) physical thing. So for a building, or a roadway, a tunnel, a bridge, or a power plant, a typical set of drawings is composed of a finite number of authored directive visual statements. These represent the finite number of specific locations about which an author has chosen to make visual statements. These are selected statements that are representative of the entirety of a project, while most of the locations in a project in fact are not drawn. This last point really comes close to the essential nature of the medium of drawing. Authorship is applied only to the set of locations that the author selects. The selected locations are drawn, and the rest of the locations are not drawn. They are in a sense, discarded. While it sounds obvious, stating the obvious does not diminish the importance: drawings that are not drawn need not be certified as correct and complete by the author. This kind of stark authorship clarity is the strength of drawings. But drawings have stark weakness too. Their weakness is lack of clarity during interpretation. 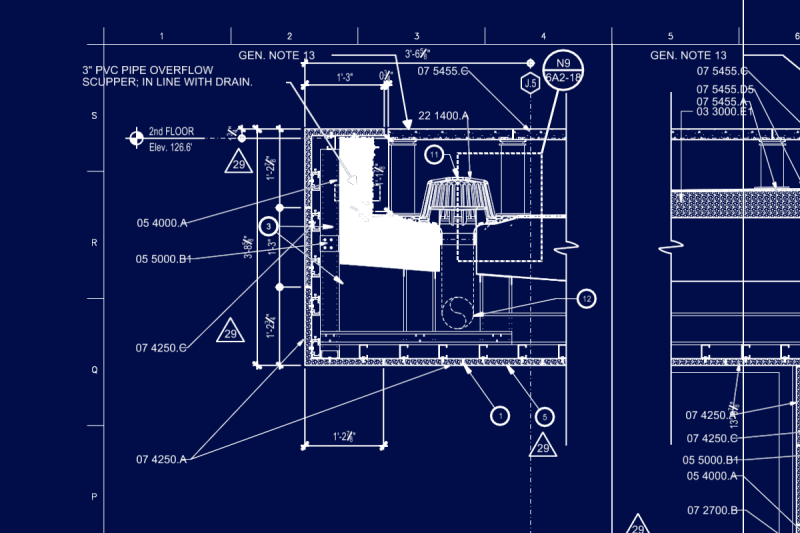 Builders use drawings – they read and interpret them. Doing so, they are confronted always by the abstractedness of the medium of drawing. Drawings are like isolated picture puzzle pieces that are abstracted from the entirety of the completed picture puzzle (see figures 1 and 2 below). For any picture puzzle it is indeed difficult to thoroughly and correctly understand the meaning of any puzzle piece without being able to see the puzzle pieces around it. Abstraction is a significant problem. 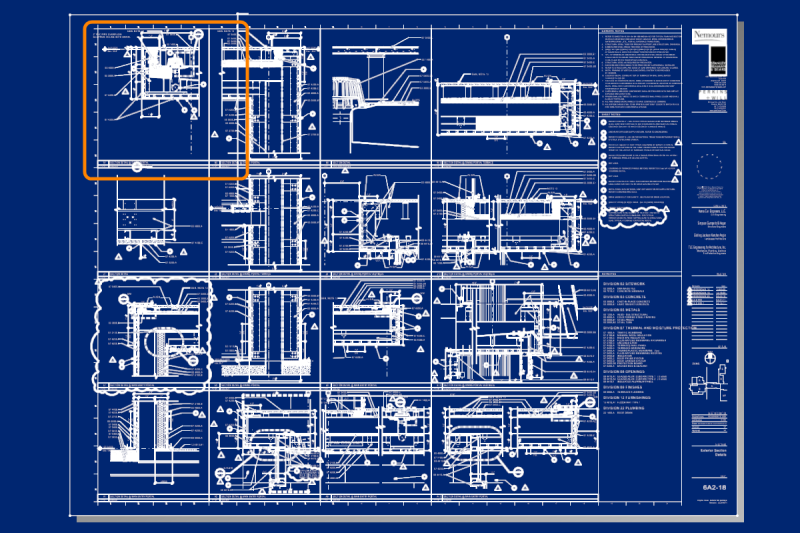 Construction firms often report that deciphering the meaning of abstract puzzle pieces (drawings) represents a very large amount of time, and some even say it is their firm’s greatest challenge. figure 1 Bentley thanks Stanley Beaman & Sears Architecture and Nemours Children's Hospital for drawings and models. figure 2 Bentley thanks Stanley Beaman & Sears Architecture and Nemours Children's Hospital for drawings and models. This tells us something indeed important about our relationship to drawings. We tend to accept with regard to interpretive clarity, that drawings are as effective as we can expect. Our focus is not on interpretive clarity but on maintaining our clarity of authorship, which takes priority - because we certify what we author; our liability is attached to what we author. This highlights again that we certify what we author, not what we don’t author. Selection of authored locations is concomitant with the discarding, or non-selection, of other locations. While this is not the way we usually think about things, it is instructive to think about this when considering the medium of models. Models are different from drawings in an essential way. A model represents an environmental totality. No locations are discarded and none can be discarded. Therefore authorship can no longer be confined to a finite number of directive visual statements representing a finite number of selected locations that are representative of a totality. In a model, totality is explicit instead of implicit. Explicit totality has profound effect on both authors and viewers, and we need to explore it. Given an author’s liability for her statements, from an author’s perspective, a model drastically extends the authorship burden. In drawings the burden is confined to a representative and finite set of visual statements. In a model the burden extends to the totality an environment. This extended burden has a particularly severe effect when considering the liability that authorship always carries with it. Liability exposure is greatly increased, and this imposes a burden of completion over the entirety of a model, a burden which in practical terms is untenable. For evidence of this, consider a simple thought exercise. Estimate the amount of work hours required to complete a finite set of representative drawings. Now instead of that set, draw a larger set of drawings that omits no locations throughout the entirety of a project. For example, section and plan drawings, instead of being drawn at representative locations, will be drawn at 1 millimeter increments throughout the space of the project. Estimate the amount of time that will be required not only to draw so many drawings, but to review and certify them. Such indeed is the nature of modeling. The comparison is a fair one because an extreme drawing exercise like this indeed approximates the effort of modeling the entirety of an environment to completion, much like, as in calculus the sum of the areas of many small rectangles under a curve approximates the area under that curve. Or to put it another way, consider that every element in a model must not only be present, but must be correct throughout its entire expanse (individual elements can be geometrically complex within themselves), and further that all elements must exist; there can be no omissions if the intention is to certify completion. Still the reader may object and ask, can the design team never review and certify an entire model? They can. Certification of an entire environment is possible, and does happen, in cases where the thing modeled is relatively confined in scope and relatively high in standardization. A typical steel fabrication model is a common successful example of a model that is entirely complete, so it is an exception to the rule. Compared to steel models, most modeled subject matter is not as confined in scope, nor as high in standardization in terms both of its components, and their assembly. Note, though, that even as an exception, the exception is partial because a steel model still also benefits from the media advancements we propose below. Builders have no way of distinguishing between locations in a modeled environment that are certified as reliable, and locations that are not. With some partial exceptions, builders have no choice but to assume the model unreliable in its entirety. The reason is simple and seemingly intractable: models are context and information-rich environments that are composed of seemingly equal parts information and uncertainty. The uncertainty results from the lack of the capacity to discard locations other than those at which authorship is explicitly claimed; models fail to draw attention to the claimed locations and differentiate them from the unclaimed locations. The failure to differentiate puts the reliability of the entire model in doubt. Consequently, models are generally not used for the delivery of primary communication. Instead they are used only for: general orientation and design exploration, energy studies, analytical studies and planning. Certainly these uses are important, but to these we seek to add important and primary new uses. Is the current state of drawings and models a permanent state? Will drawings always be clear about authorship but remain abstract and difficult in interpretation? Will models always be information-rich while remaining equally burdened with uncertainty of the most critical kind, uncertainty regarding the locations of definitive reliability? Is it possible to imagine a different kind of visual medium that amplifies the strengths of drawings and models (clarity and context, respectively) while mitigating their weaknesses (abstraction and ambiguity, respectively)? figure 3 Bentley thanks Stanley Beaman & Sears Architecture and Nemours Children's Hospital for drawings and models. figure 4 Bentley thanks Stanley Beaman & Sears Architecture and Nemours Children's Hospital for drawings and models. figure 5 Bentley thanks Stanley Beaman & Sears Architecture and Nemours Children's Hospital for drawings and models. figure 6 Bentley thanks Stanley Beaman & Sears Architecture and Nemours Children's Hospital for drawings and models. This is a significant improvement for the two types of visual communication media in common use in the design and construction professions. When we can see the things around a drawing, we understand the drawing better. We are likely to understand it correctly, and more thoroughly, and more easily. We arrive at deeper insight, and this may even prompt us to think in different ways, to ask better questions about what we’re doing. Likewise the model is much improved, in an essential way. In the model we now clearly see the locations at which reliability is certified or claimed. The rest is context. The confidence of knowing the difference between what is reliable and what may not be reliable gives us the confidence to rely on those aspects that are reliable, instead of assuming everything to be unreliable. This gives what is needed then: a model can be the environment within which authored directive visual statements are both authored and delivered. A model is elevated into a primary communication role, serving the general purpose. The general purpose of drawing and modeling is always the same: to help us explore and see and understand what we are trying to do, and to help us communicate that in ways that can be understood, correctly, thoroughly, and easily. Does this step forward signal an innovation frontier? The innovation represents a general principle that surely can be applied across a variety of types of environmental media, and across a variety of types of authored directive visual statements, many of which are yet to be discovered, while some have already been discovered. 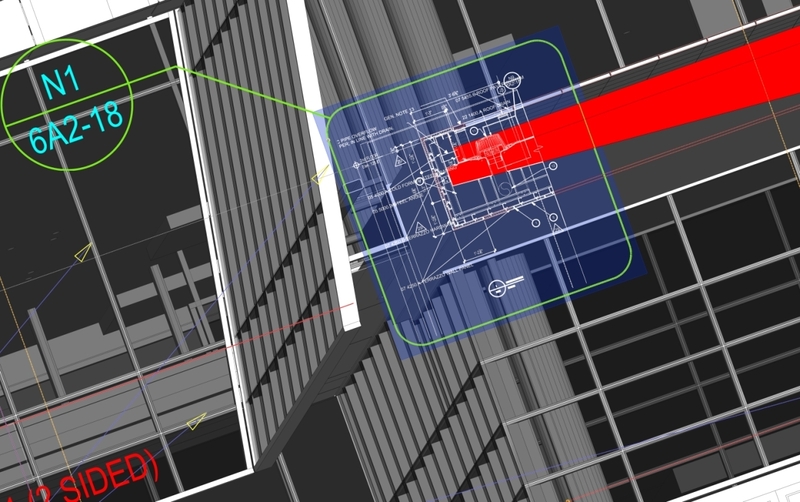 See Stephane Cote’s blog post on hypermodel augmented reality, and virtual excavation demonstrating new combinations of environmental media and new kinds of authored directive visual statements, supported by new kinds of visual transformations. A renaissance in media itself appears to come into view. Is this an overstatement? The coming years will tell. A new kind of project documentation (please see the blog post above) did not exist before 2012, and is only available from Bentley. It makes it easier for you to create documentation that is clear and understandable. It makes it easier for you to see what you are doing, understand what you are designing, and control the scope and completion status of your drawings and models. Likewise it makes those drawings and models more useful for construction firms. Now they can more easily, correctly, and thoroughly interpret and understand your visual communications. It saves you time and money, and it saves them time and money. Deliver drawings in models instead of either one alone. If you were in the movie making business you would want to author and deliver movies with sound and picture integrated and synchronized. Do the same now with drawings and models, and enrich both media. John, Thank you. we have this page www.bentley.com/.../hypermodels As case studies become available we will post them. This is great stuff, especially for renovation projects, have you a similar writeup on Crossrail or the China hydro plant?